Live at The Hilbert Museum Feb 2! If you’re craving some good art and good music, you are in luck! Our duo will be playing at the Hilbert Museum near the Orange Circle this Saturday night from 6pm to 8pm! The event is free and the museum will be displaying gorgeous Mary Blair and Norman Rockwell pieces. Parking is also free and available nearby. Rain is predicted but honestly I can’t think of a cozier atmosphere on a rainy evening. We have a very fun set planned, so swing by and say hello! At this point, I have written enough music for a new album and my hope is to record and release it by this summer. I also want to film and release my first music video, so that’s exciting! I also have some other exciting opportunities in the works, but I don’t want to say too much too soon. I am still playing music for weddings and private events, but working toward taking that next big step in my career. I’ll also be uploading new videos onto my youtube channel next month. I know I’ve been keeping things on the DL but you gotta believe me when I say I’m BACK baby, just like Amanda Bynes, I am BACK and better than ever. 2019 is The Year. Thanks for reading and hopefully we see each other soon! When we saw the giant inflatable fire hydrant, we just had to get a photo in front of it! We had a lot of fun at this one. I have at least one more video of us from this night that I’ll hopefully get my hands on soon. If you haven’t subscribed to my youtube channel yet, please do so! I’ve been saying this for the past year, but I truly am about to post tons of new content and consistent weekly videos ranging from playlists to suit each mood to vocal advice. Look out for all this come February of next year! In early October we had the opportunity to play a wedding in the redwood forest of northern California! The bride and groom got married in a circle of redwoods, which was breathtaking to say the least. We had a lot of fun playing the ceremony and then leading guests over to cocktail hour in a “second line” singing Boubon Street Parade with kazoo and all. Here are a few little pics from that magical day. On another special day recently, my brother renewed wedding vows with his amazing wife Leanne. It was also their 10 year wedding anniversary. They got married in Central Park at Bethesda Terrace where I sang Danke Schoen acapella. Finally, I’ve been keeping busy with weekly performances at an upscale senior living home in LA. I enjoy it because I get to sing all the old songs I love (I’m talking 1920s old) to an audience that remembers and appreciates the music. These are my people! I was the featured performer in October and here’s the poster to prove it. Enriching lives all over Southern California. Since I started this post 24 hours ago, I’ve already booked a few jazz and holiday parties, so I’m bracing myself for the wonderful business that December will bring! I’m so grateful to be doing what I love most in this world— singing. Thank you to everyone who supports me and appreciates the work I do. I will work so hard to give you new music, videos, and live performances very soon! Boy do I have news for you! I am now offering voice lessons and ukulele lessons at very affordable rates. If you live in Southern California, you can take these lessons in person and if you live elsewhere, skype lessons are available. I already have a few students and I’m now looking to expand that list. If you or anyone you know may be interested, send an email over to jillsargeantmusic@gmail.com for rates and info! 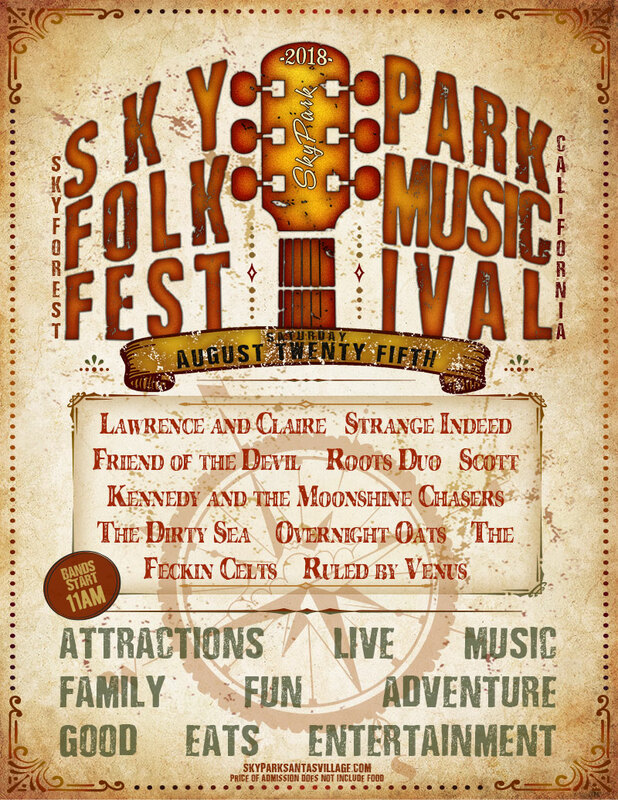 And Skypark Folk Festival near Lake Arrowhead on August 25! We had such a blast at this festival and were honored to play for such an appreciative crowd. I think my dad (mr bluegrass fan in the yellow hat) had an awesome time too! On August 29 we played a special event at La Venta Inn which is completely gorgeous! Such a dream! People danced and mingled and enjoyed the view (especially at sunset). Someone mentioned that the mountains hadn’t been visible for months so we were there on a special day with an exceptionally clear view. We will play there again for a private event soon! In addition to these lovely events, our duo has continued to play at Cedar Creek Inn (Brea) twice a month. Catch us some Tuesday night! Also, I was recently offered a weekly performance gig at Montecedro, a luxurious senior living spot in Pasadena. The staff and residents are so kind and generous, and even though it’s a bit of a drive from Long Beach, I love seeing these people and singing the music they all remember. Such a joy. That’s my little chair (and umbrella!) on the right! It’s a tough job but somebody’s got to do it. Singing on the beach during some of life’s most special and romantic moments…very grateful for these opportunities! This past Sunday, September 23, Gordon and I participated in a “Battle of the Bluegrass Bands” at Mothers Tavern in Sunset Beach. It was the most fun I’ve had at a gig in a loooong time. Dollar bills on the wall and cowboy boots on my feet. My dad joined us on banjo on a few songs with his bluegrass group and they killed it! It’s so much fun singing with a big band and hearing the sound really fill the room. I couldn’t believe how many people showed up to cheer us on and the shouts and applause we got after every song (…for 3 hours!) really blew my mind. Thank you Mothers Tavern for making a girl and her band feel special. My dad on the banjo!! His band joined us, so fun! Just when you thought this post would never end, I must wrap things up. I’m off to practice for the next gigs! Kudos to you if you’ve read this far. You are either my dad or a super fan. Thanks!! I will leave you with a photo of me and my dog, Banjo at the beach. Bye bye until next time from me and a good boy! Ahoy mateys! Summer is here and the heat is HOT! But that won't stop me from singing. We will be playing Fourth Fridays in Long Beach again this Friday (July 27th) from 6 to 9 in front of Meow Vintage. We love this location and this event, so swing by and listen for a few tunes (or more)! You can also find us playing at Cedar Creek Inn (Brea) twice a month. Check the "shows" tab for exact dates. We have some private events in the coming months and then a double feature on August 24th and August 25th! We are excited to play our first folk festival! Enjoy the music along with all the fun outdoor activities, shopping, and restaurants offered at Sky Park near Lake Arrowhead California. If you haven't seen my new jazz demo video, check it out now! Cameo by Banjo the dog. We have a film-sesh planned for this weekend, so expect a bunch of beautiful new videos soon! More soon! Have an awesome week. Rockin' the pink, ohhh yeah. We shared two new songs we recently wrote and I think it went well! See you next year, Fullerton! Check out the "shows" tab to see where I'll be singing next. I'm doing a few songs at Sacred Roots in Long Beach on July 13 and of course our duo plays Cedar Creek Inn in Brea two Tuesdays a month. We'd love to see you there! Somehow, it is June already! Which means Summer Solstice is right around the corner. Join me and Gordon on the longest day of the year (June 21st) as we play all over downtown Fullerton! I'm working hard on new music so we can debut a few new tunes. It's my tradition to play new original songs at Day of Music! Search "Overnite Oats" below for more info and exact addresses! I also have another jazz video up on youtube. This is an old song from the 20s called "Dinah"
Demo video of three jazz songs coming soon! Catch us at Cedar Creek Inn in Brea (we play there twice a month) and we will have more gigs open to the public soon! Stay tuned. If you haven't already, sign up for my email newsletter to be the first to hear about shows, new music, and more! This coming Sunday, Gordon and I will be playing music on the plaza at Segerstrom Center in Costa Mesa before a performance of Hamilton! We will be there next Sunday too. May 20th and 27th from 5pm to 6:15pm both evenings. I'm super excited about this gig because Segerstrom was my first exposure to professional theatre. I saw countless shows here throughout my life, awestruck at almost every one. This venue definitely served as a source of inspiration for me, and it's one of the reasons I'm a performer today. So yes, I'm stocked that we were asked to play here before Hamilton! We have new songs, both covers and originals. Come say hi and grab a bite at the cafe while you're at it! We are still playing Cedar Creek Inn in Brea every other Tuesday night from 5pm to 8pm. We will be there tonight (May 15), May 29th, June 12th, and June 26th. They have an amazing happy hour until 7, so get those good deals! New video up, a little jazzier than my other ones. We are joined by our upright bass playing pal, Christian. We are also playing music from 6pm to 9pm in Long Beach as part of Fourth Fridays on Retro Row next Friday, May 25th. Wander around and find us! Gordon and I are signed up to play Day of Music in Fullerton again this year on June 21st, so mark your calendars! I'll provide more details about where and when we'll play as we get closer to the date. Phew...I think that's everything. For now! Hopefully we will see you soon at one of these shows! We are also working on some super secret new music, so get excited! We had our first gig in Hollywood, baby! Gordon and I played music for an event in a new luxury apartment building on Hollywood Blvd as part of an event called "Sushi, Sake, and Singers"
Here are some pre-event photos. Our greenroom was an empty apartment overlooking Hollywood Blvd! I call this one "girl with setlist"
You can see the Griffith Observatory from the pool! Every set needs a kazoo! Hi friends! I've been keeping very busy with gigs (and the dog) but managed to upload a couple videos. Here is a cover of the song Home by Edward Sharpe! Remember to subscribe to my youtube channel to see all the latest videos! And if you want to come see us live, we play every Tuesday night in Brea from 5 to 9 at Cedar Creek Inn. Come say hi, enjoy some sweet happy hour deals, and even sweeter music! House of Blues Show on Weds Jan 17!! And tell your friends! The space looks really cool, so let's make it a party! We also started our residency at Cedar Creek Inn in Brea every Tuesday night, so come chill out at the bar and let us serenade you from 5pm to 9pm. Cedar Creek is super cozy with a log cabin feel, fireplaces, and the whole shebang. Tables near the bar are family friendly, so guests under 21 are totally welcome. We'd love to see you there soon! And below is a lil playlist of holiday tunes I recorded while practicing for gigs. Nothing fancy, but some extra ukulele and holiday cheer! Tonight (Friday, Dec 22) Gordon and I will be playing in Long Beach outside near the Art Theatre on 4th st during Fourth Fridays. We will be there from 6 to 9 playing all our hits PLUS holiday tunes! Grab your warmest coat and stop by! Happy Holidays, everyone! A good time to rest, reflect, and plan for a fresh start. Bring on 2018! We just had a busy weekend! I played a lovely couple's proposal dinner back in January, and recently had the pleasure of singing at their wedding! They had the ceremony in Malibu and everything was absolutely stunning. The same day, Gordon and I played with our buddies/ occasional band members Christian and Lis. We really love playing with these two! As lovely as it is to sing and play in our duo, having more people gives a certain life and energy to a song that I just adore. Here's a pic from the birthday party. The band minus me...because I'm...taking the photo. New business cards for Overnite Oats! I will say I got more five dollar bills than I ever have while busking, whatever that means! I didn't make much more $ than usual, but the fivers were pretty awesome. I love being a 1920s cartoon girl! It's groovy!! The artist's name is Miles Lewis, check him out. Gordon and I are headed to New York for a fall vacation, so it'll be pretty quiet for a week or so, but expect lots of public performances soon! Alright babies, keep it real. Our country is falling to pieces, and here I am, writing a blog post about my music career! OK?!? Gordon and I have had a fun and busy August/ September. He got flown out to New York and Michigan for business, and I joined him in Ann Arbor for a few days. It's so beautiful there! We just got back from Palm Springs after a gig there over the weekend, AND we had the pleasure of being termite-tented last week!! Life is definitely keeping us on our toes (and in bags. everything we own is in bags). Soon things might return to normal, but then again, maybe not! We promise you lots of cute pics, videos, and updates! Decorations were beautiful, the people were nice, and best of all: they had a pool. Perfect when it's 110 outside! We had a lot of fun singing to kids and grown ups alike. We also enjoyed the mini vacation we decided to take afterward! We played at a chocolate shop in Los Angeles (ChocoVivo) on September 22 for their Jazz Night and we had such a lovely time! The air was crisp and it was a perfect evening for jazz and hot chocolate. Here's a pic of me, but Gordon was there too, killin it as usual. Here we are before we performed-- all smiles! I've got a new (ish) video up! Next one I'll be posting is "The Way I Am" by Ingrid Michaelson! That's all the public performances I've got coming up for now; hopefully I'll add more soon! The good news is we've been playing a bunch of private parties and we're keeping busy with weddings, birthdays, etc! They're a lot of fun but they're also a lot of work, so I'm grateful to have more free time to give 100% to these well-deserving clients! Don't forget to subscribe to my newsletter to find out where I'll be playing next! Not to mention music releases, secret shows, free stuff, aaaallll the gossip. I think that just about covers it. Lots of private gigs, no more day job (...for me), we're figuring it all out and having some laughs along the way. Here's to the future and all the good things to come! I have hope for a better future. An America where people do not live in fear of being shot for their skin color, sexuality, or for just...leaving the house. We can get there. We just need these rules to change. And we need to talk about it. Constantly. Until something changes for good. On that note, have a cheery week! Be good, do what's right, your smile brightens someone's day! We are getting ready to play a wedding this weekend, sounds like it'll be a lot of fun! A lot has happened since my last blog post in April! Gordon and I have been keeping busy with private gigs, plus a few more exciting shows open to the public. 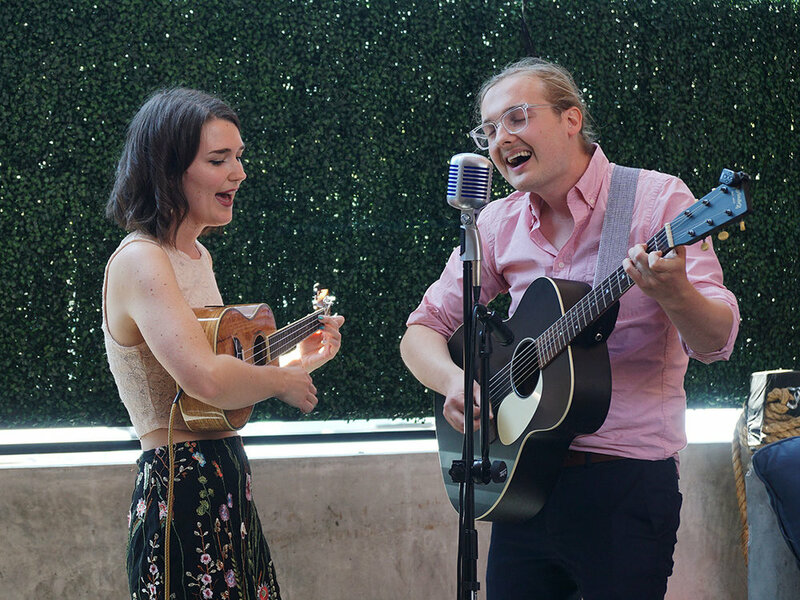 In June, I sang jazz at a hip little cocktail lounge called Birds and Bees in Downtown LA. The Jill Sargeant Trio made our West Coast debut and it was a lot of fun! We also played at Downtown Fullerton's Day of Music! Here is a clip of me singing "Dream a Little Dream of Me"
We have been going to some jazz jams in the area and meeting local musicians. So many awesome people to sing with, so little time. Not sure if this link will work out, but here is a very dark but lovely video of me singing "Aint Misbehavin" with some cool new dudes. What else? Such a gorgeous setting for a party. 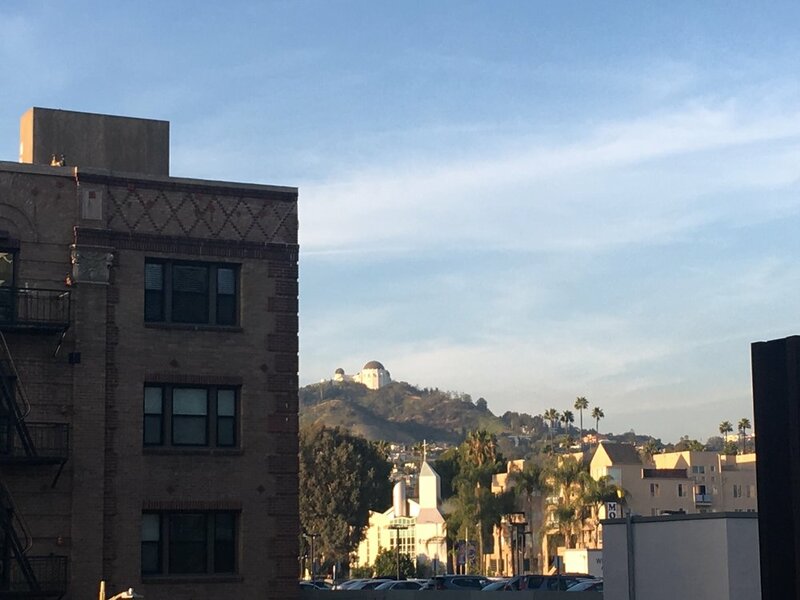 If I could see the ocean and the hills of LA at every gig I play from now on, that would be a-okay with me. Gordon and I are playing two farmers markets soon, so mark your calendars! To stay updated on gigs, follow me on Instagram and Facebook! And you can always book me (or us) for an event via GigSalad! That's all for now, babes! i had the honor of singing/ playing for a private proposal dinner. with balloons and rose petals everywhere, a private chef, and live music, how could she say no?!? we must have had some fans because i found TWO twenties in the tip jar! so cool! here i am looking incredibly unprepared for a photo ;) we played two hours of jazz standards and oldies at a nursing home on easter! a beautiful day for easter brunch on the patio. i loved seeing all the families (and the easter bunny!!) arrive! we were the headlining act (...the only act) at an awesome music festival themed kids party! we got swag bags and everything! the parents really went all out on this one. we played three hours of tunes at mystic arts gallery in laguna beach! Sooo as you can see, we've been bouncing around singing for everyone and anyone! And these are just the ones I got pictures of. We have somehow managed to squeeze in family time, friend time, and a vacation or two! Gordon's parents visited last month and our families took a trip to Yosemite. Which was majestic. 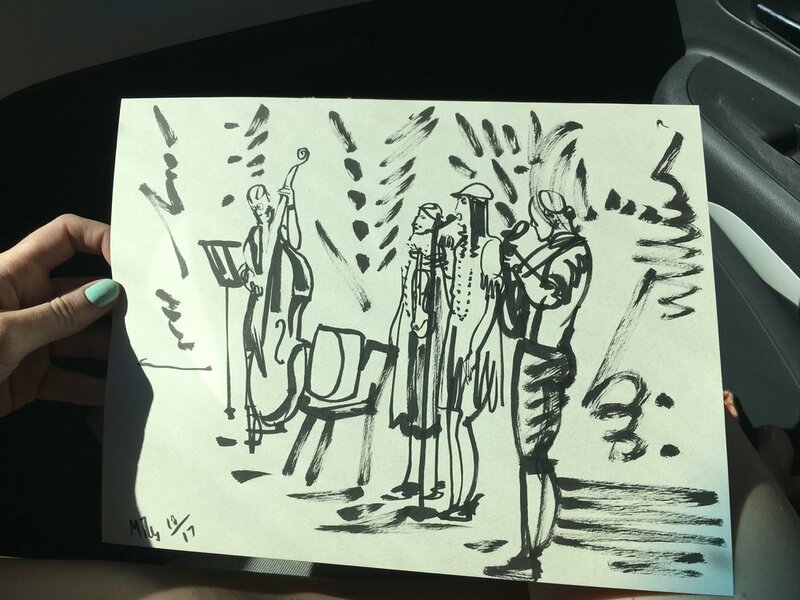 We also recently met a violinist who lives close by, and everything felt/ sounded amazing when we played some songs together. So we may bring a bit of violin to some gigs and videos in the future! ALSO last night we were lucky enough to be able to see the Watkins Family Hour in LA (with special guest Joey Ryan from the Milk Carton Kids) and o.m.g it was incredible. So much talent in one room... the entire night was very inspiring. We spend so much time watching videos of these musicians that it's surreal to finally see them live. The whole night was filled with music, laughter, and healing all in an intimate environment. Gordon and I hope to someday be even a fraction as good as any of them and to create an experience like that for audiences. I am probably forgetting to mention something else that happened, but forgive me, since it's been a whirlwind! We are working on getting some gigs that are open to the public and it's a personal goal of mine to have a recurring jazz gig in LA. Once we have more shows lined up, I'll update the site and send a reminder through my newsletter! The previous blogpost has a newsletter sign up form! Alright everyone, until next time, stay kind, stay positive, and stay awesome. Wow, a lot has happened these last few months! Gordon and I have been adjusting to life in California and generally getting our sea legs. New jobs, new home, new schedule, new everything! It's very fun but also exhausting. I started a full time job as a barista, which is nuts because I have only ever worked part time (supplemented with singing gigs), so if I seem a little quiet on social media, I apologize! Things have been calming down on the personal front though, and gigs have been picking up! Gordon and I (AKA: Overnite Oats) are playing a gig at an art gallery in Laguna Beach on April 6th! Mystic Arts Gallery. We will be there from 6:30 to 9pm and the event is free to attend. Spice up your Thursday with art, music, and lots of love. We'll be crooning a nice mix of jazz, folk, and originals. Also! We had some snazzy new photos taken by the always talented Sargeant Creative (awesomeness runs in the family). I love them. Take a peek! We hope to see you on Thursday and definitely subscribe to my email newsletter and like us on Facebook to stay in-the-know about upcoming performances! Hello friends. I hope everyone is hangin' in there. After about 6 months of testing out "Raspberry Roadshow" we felt that it didn't quite sit right. Lately, we just identify as Overnite Oats. Gordon and I submitted a video of my song "Cheer Up" to the NPR Tiny Desk Contest. Tell your friends, tell your mom! More good stuff coming very soon. We are BACK in Southern California!! Well, I'm back. Gordon has never lived here before, so he's a new addition to California soil! After a ton of packing, driving a Uhaul across the country, finding a new apartment wayy faster than we thought, and the craziness of the holidays, we are finally getting back into the groove of things. It has been a very wild past few months, but it's all starting to settle down. And I am so happy and grateful to be home. New York City is fun until it's not! But California is magic. Gordon has a new engineering job and I'm looking to re-build my networks for babysitting and music. We've got some big changes coming and some exciting projects in the works! Living Room Show and california! Hello my buddies! I've got some news for you! 1) Gordon and I are moving to California next month (mid-November)!! 2) We are having a show this Friday! In our living room! A quaint cozy night of wine and music. Stop by if you can! But space is limited, so RSVP here! Maria Caputo will be our guest musician (and we may have another surprise or two). This is possibly our last gig in the city, so we hope to see you there! Here is the facebook event for more info! We also went to Michigan and Kentucky last month, which I thoroughly enjoyed! We played at Blue Tractor BBQ and Gordon basically had a mini-family-reunion with all his Michigan relatives! We saw Regina Spektor at Town Hall this week, which was a total dream. Other than all that, we have been doing all the autumn things and trying to soak up as many New York experiences as we can before we leave!! This hasn't left us much time to record videos (plus there has been a whole lot of construction noise/ light blockage in our apt these past few months...don't even get me started) but we plan to have more up soon! And if you haven't seen our latest uploads, check em out! That's all for now! Keep it real my babies and don't forget to GET SPOOKY THIS MONTH! !